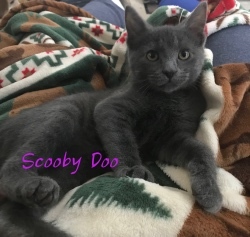 Scooby-Doo is a spunky male kitty born in November 2018. He is full of energy but also loves to cuddle. He’s very nosey and will follow you everywhere. He gets along well with other cats & kittens, dogs & kids. If you are interested in meeting or adopting me, please contact Trinity at 419-277-9499 to get in touch with Scooby Doo's foster mom!